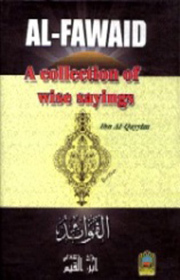 A collection of wise sayings is a fantastic book on sayings from a man who is a gem to this nation , this is the famous book written by ibn qayyim. If you are afraid of any creature, you will run away from it. When you are afraid of Allah, you will love Him and seek to be close to Him. How can one feel secure, who has an unmerciful wife, an unforgiving son, a distrusting neighbour, a friend who gives no advice, a partner who misjudges him, an enemy whose hostility never ceases, a soul that is inclined to evil, an adorned world, vain desires, influential lusts, furious anger, the deception of Satan, and controlling weakness? If Allah rescued and guided him, all those problems would be under control, and if Allah deserted and abandoned him, leaving him on his own, all these distresses would cause his destruction.